I am so excited to announce a fabulous, and first, giveaway for La vie...J'aime readers! As fashionistas, I am sure most, if not all, of you saw Confessions of a Shopaholic this past winter. We were treated to the life and buys, esp the beloved green scarf, of Rebecca Bloomwood. We also learned how to be a recessionista during these trying economic times (giveaways certainly help!). Now one of you can be the girl with the green scarf with this Collection Eighteen chiffon scarf giveaway from Chickdowntown.com! And yes, this is the actual scarf from the movie. 3. Leave a comment on this post stating how you would wear the green scarf in the most recessionista, money-saving, savvy way. Comment by Thursday, September 24 at midnight. One winner will be announced on Friday, September 25. Great giveaway! It's already chilly in Boston and scarves are a must! I think it would dress up any outfit! I'm following...I am following on Twitter...and I would wear the scarf to make my Black suit SUPER! I have a Giveaway on TODAY for one of my original Art pieces over at my blog...head on over and enter...you never know! I'm a follower. I love that green scarf. I will wear it as an accent to my fave all-black ensemble. And it's truly a great memorabilia. I set up a Twitter account JUST to enter your giveaway haha. This is very cool you got the actual green scarf! I would wear it with neutral colors while 'window shopping' online at work to hopefully remind me not to buy anything! I am now following you on BlogLovin', Twitter, and Google. 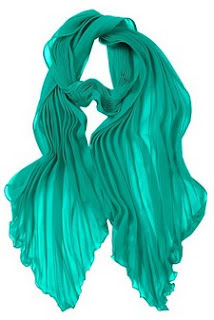 I would wear this lovely scarf with a black knit long-sleeved top, skinny jeans, and knee-high boots. I would allow this particular piece to be the standout bit of my ensemble as it is so bright and cheerful! Wow...this color would really serve me well...it's gorgeous. I would wear it a million different ways, but most likely with a long sleeved black tee, jeans and high boots. Recessionista because I wouldn't spend a dollar on the outfit...I am recycling everything I have in my closet this year!! Hey Girl!!! I really hope I could win this!!! Well, I don't own any scarf, so I must have this one : )) That's a good reason right?? Yeah another Boston blogger! I'm so glad you found me through another blog. I just became a follower of your now. We will have to plan another get together soon because last night was a blast and you def. have to come!! Love Rebecca Blooomwood and the Shopaholic series, they are some of my favorite books!